Sam (Moore) and Dave (Prater Jr). made a major cultural impact as one of the most successful “crossover” acts of their era influencing everyone from The Beatles and The Stones to Bruce Springsteen, Bon Jovi and, of course, The Blues Brothers. The impact of their unique call and response sound and style continues to do so today. The duo’s legendary hit single “Soul Man,” which was written by Isaac Hayes and David Porter, with a little help from Sam, released on the historic Memphis based Stax Records label, hit #1 on Cashbox’s Pop Charts November 11, 1967 – 50 years ago. The single also topped the Billboard Hot Black Singles chart, #2 on the Billboard’s Hot 100 and #2 in Canada. Sam & Dave’s now immortal “Soul Man” earned the duo the 1968 Grammy Award for Best Rhythm & Blues Group Performance, Vocal or Instrumental. “Soul Man” earned other distinctions. It was the first song written with the words ‘soul’ in its title and the first time the words “soul” and “man” were coupled together in English language usage. In addition to Moore’s golden “Soul Man” anniversary celebration, his exposure and recognition is not slowing down! “Wrap It Up,” the b-side to the duo’s hit single “I Thank You” released in 1968 has been selected by Subway for their 2017 Reuben Sandwich commercial campaign. Click youtu.be/f5onlS9XceA to watch the commercial. The Legendary Soul Man™ has just released his latest album. Sam Moore: An American Patriot, available for purchase including downloads on iTunes, Amazon, and more. 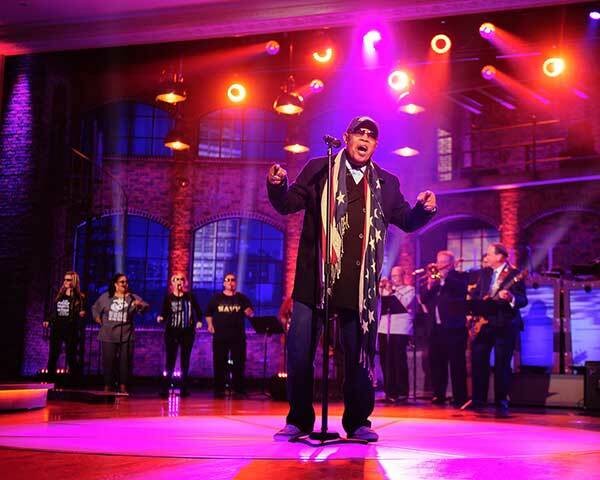 You can tune in to TBN’s Huckabee this weekend to see Sam perform “God Bless America,” “Soul Man,” and “Lift Every Voice,” as he continues his promotion of this album project. The album was inspired by Moore’s performance of “America the Beautiful” on the steps of the Lincoln Memorial, where his dear friend and inspiration Dr. Martin Luther King, Jr. stood 53 years earlier and delivered his famous “Dream” speech. Enlisting the skills of renowned producer, arranger and songwriter, Rudy Perez, a Cuban refugee, who, with Moore has crafted An American Patriot with the goal of recording versions of iconic American anthems like they’ve never been done before. In Moore’s recognizably unique style, he has recorded classics such as “Battle Hymn of the Republic,” Lee Greenwood’s “God Bless the U.S.A.,” and Marvin Gaye’s “What’s Going On.” In addition to the traditional songs, the album also features new songs such as “Show For You,” the 2017 Department of Defense Warrior Games anthem, “Peace Please,” and “Land of the Free.” It is with the hope of rekindling love of country and each other that Sam Moore: An American Patriot is offered.